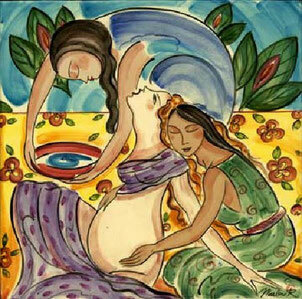 A doula is most likely a female person who supports the mother during pregnancy, labor, birth and postpartum. For centuries there have been women helping their (grand)daughters, sisters, friends during birth in almost all cultures. But with families living great distances from each other and the focus shifting to the medical/clinical aspects of birth the non-medical birthing support almost got barred from the birthing rooms. There were times even the father was not allowed to stay with the mother and his baby during birth and after! Other studies (f.e. Kennel, Klaus & McGrath) show that the continuous presence of a doula shortens labor times, women are less likely to ask for pain medication, the need for other medical interventions like assisted deliveries via forceps or vacuum are decreased. Furthermore a significant improvement in postpartum outcomes such as breastfeeding success and postpartum depression is presented in those studies. Wherever the woman chooses to give birth (at home, in a birth centre or in a hospital) her doula will provide continuous emotional, physical and informational support. Compared to the medical staff (midwives, nurses, doctors) a doula will not work shifts (although she should have a back-up just in case),give medical advice or perform clinical tasks like taking temperature, vaginal exams or fetal heart rate monitoring. A doula provides emotional support with continuous encouragement and reassurance, physical comfort through various techniques like breathing, massage, relaxation or suggestion of different positions for labor and/or birth. But she will never make a decision for the woman or her partner. Every woman has different needs, so the individualized care by the doula is based on the circumstances and the woman's preferences. Doulas must be very flexible and respect all of the mother’s choices; they do not project their own values and goals onto the laboring woman. It is the doulas mission to inform the mother about various options, risks and benefits so she can make an informed decision by herself. Besides a doula will encourage the mother and her partner to ask questions of medical staff. 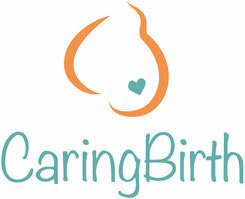 The doula should make every effort to foster maximum self-determination on the part of her clients. A doula will not only support the mother, but also the partner (that can be the father of the baby, some other family member, a lover, or a friend). Ideally they work together as a team, complementing each other's strengths. Usually a doula is an „outsider or stranger“ - more objective and less emotional involved - and cannot make the same contributions, such as giving love or having intimate knowledge of the woman, like the partner can. Occasionally some fathers become very stressed, they feel helpless and are relieved to rely on a doula for help and support. This way they can enjoy the birth of their child even more. In case the father wants to be involved, the doula will guide him with helpful techniques to support the mother. The same applies to other birth companions, like friends, family members etc. To maintain high standards of personal integrity and professional practice and competence a DONA International affiliated doula needs to abide by the Code of Ethics and Standards of Practice for birth doulas. Her responsibilities to her clients include – but are not limited to – a confidential service agreement that might include at least two prenatal meetings, help with the preparation of a birth plan, continuous support during labor and birth, immediate postpartum support and at least one postnatal visit. The doula should make back-up arrangements with another doula to ensure services to the client if the doula is unable to attend the birth. Should any doula feel a need to discontinue service to an established client, it is the doula’s responsibility to notify the client in writing and arrange for a replacement, if the client so desires. It is imperative that the doula respects the client’s privacy and will not share personal information without the client's consent. Fees should be reasonable and fair with due regard for the client's ability to pay. The doula is encouraged to assist the DONA International vision of “A Doula For Every Woman Who Wants One” by making reduced cost or no cost labor support services available when possible. Hodnett ED, Gates S, Hofmeyr GJ, Sakala C, Weston J. 'Continuous support for women during childbirth', Cochrane Database of Systematic Reviews 2011, Issue 2. Art. No.:CD003766. DOI: 10.1002/14651858.CD003766.pub3. Kennell, J.H., Klaus, M., & McGrath, S.K., 1991, ‘Continuous emotional support during labor in a US hospital’, JAMA, vol. 265, pp. 2197-2201.